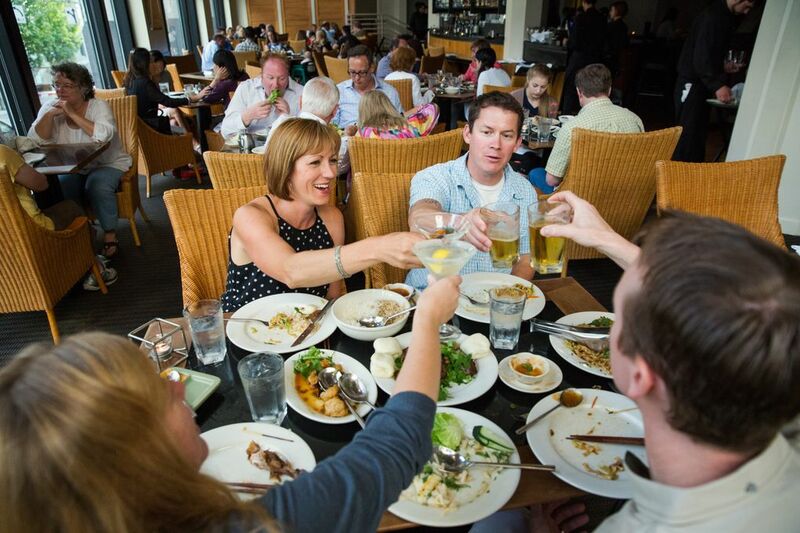 One of Seattle’s most famous restaurants, Wild Ginger has been serving delectable Pan-Asian meals to regulars and tourists alike for a quarter century — and it’s as good as ever. Back in 1989, Mikhail Gorbachev was head of the Soviet Union, the San Francisco 49ers were the Super Bowl champs and Wild Ginger opened on Western Avenue below Pike Place Market. A lot has changed since then, but not Wild Ginger. True, it’s no longer on Western, and its capacity more than doubled when it moved into the glamorous, grandly proportioned, bi-level space at Third and Union in 2000 (when it was last reviewed here by Nancy Leson, who bestowed three stars). But for 25 years, Rick and Ann Yoder’s pan-Asian eatery has maintained a remarkable consistency. Tourists traipse in, but so do the locals: business people entertaining clients, concertgoers and celebrants of all sorts. Solo diners frequent the satay bar. Drinkers congregate in one of two intimate lounges, upstairs and down. Groups of any size are easily accommodated: in booths as big as an SUV, at large round tables fitted with lazy Susans or, if the occasion demands seclusion, in several well-appointed private rooms. The atmosphere is cosmopolitan, the mood festive and the food reliably good, sometimes even great. Can you get Asian food this good for less elsewhere in the city? Of course, but not always with ingredients of this caliber, and not with the amenities you’ll enjoy here — sommeliers to discuss the award-winning wine list and equally well-informed servers who painstakingly wipe tables between bouts of shared plates and deliver warm washcloths at meal’s end. Scented finger bowls follow the messiest fare, among which is the wok-seared Dungeness crab in a sauce rife with ginger, garlic and scallions. It’s served whole, but dismembered and cracked just enough to make your task at the table easier. The crab carried a steep market price ($52), but it fed four and included rice. By contrast, a single deep-fried soft-shell crab, a $17 appetizer from the fresh sheet, was wondrously crisp and sweet, but gone in just four bites. Sharing is the norm and food comes to the table when it is ready — sometimes in the blink of an eye. You might order appetizers, then see how hungry you feel. Main dishes are offered in two sizes and you may not need or want full portions of each. Start with supersized pot stickers, house-made and stuffed with gingery minced chicken, or a crisp green papaya salad funky with fish sauce and bright with lemon, or some satays. Those grilled skewers each come with their own sauce, a sweet, compressed rice cake and pickled vegetables. The best of the bunch I sampled: Nam’s prawns with a searing Cambodian chili sauce; Kurobuta pork with a sweet raisin-plum sauce; and curry-spiced Vietnamese Hawker Beef with peanut sauce. 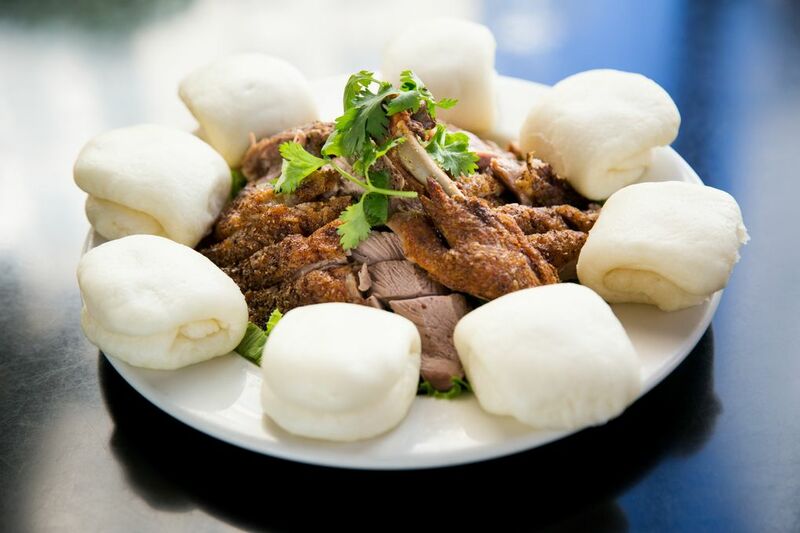 The scent of cinnamon and star anise rose from the crisp skin of Wild Ginger’s classic “Fragrant Duck,” one of the must-have mains. Tuck a piece into a steamed bun, along with some coriander sprigs or lettuce, and add a dollop of plum sauce jazzed with Szechuan peppercorn salt. The multicultural kitchen team, led by CIA-trained executive chef Jacky Lo, skillfully employs heat and spice. Sweet golden scallops bristled with black pepper. A pale green coconut milk sauce for Panang beef curry blossomed in the mouth, dropping hints of galangal, cardamom and basil like petals. A red sauce for Manila clams — pulled from the live tank and tossed into a wok with fresh tomato wedges and sweet red pepper — thrummed such a perfect chord of hot, sweet and savory, it almost didn’t matter that some of the shellfish were gritty. Likewise, fried tofu with eggplant were a little tough-skinned, but their potent sauce — perfumed with lime leaf and basil — completely captivated. Fresh noodles were standouts, too. Squid, prawns and mussels nestled among wide Thai rice noodles in a gentle soy-based sauce. Long, fettuccine-like Mongolian egg noodles, made in house and tossed with crisp, julienned vegetables, have decidedly more chili heat, countered by a spaghetti-like coil of cooling cucumber on top. Nothing, however, refreshes quite like a dessert of fresh mango with sticky rice smothered in coconut-y peanut sauce, unless it’s a big scoop of blackberry sorbet swirled with vanilla ice cream made in the Skokomish Valley by Olympic Mountain, another local treasure that’s been around even longer than Wild Ginger. Information in this article, originally published Aug. 15, 2014, was corrected Aug. 18, 2014. A previous version of this story incorrectly spelled the name of executive chef Jacky Lo.